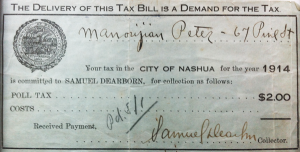 When I first started researching my genealogy, everything was on paper. I had notebooks, scraps of paper, and photocopies of records. I’m terrible at organizing paper records; I was always losing things. My digital practices have evolved over time. At the beginning, I used software that lived on my Mac. It may have been some version of Family Tree Maker, I actually can’t recall. Once I signed up for my first Dropbox account, I started saving all of my notes there in various formats: Word, Pages, Plain text, Rich text and PDF. As you can imagine, this was a problem when it came time to search for things. Now I have most of my data in TNG hosted on a Dreamhost account. It’s the best solution I’ve found for managing trees and exporting to gedcom. I still struggle with the idea of notes, however. In TNG, there is a notes field, but I don’t really like the UI and I also don’t know if it’s the most efficient in terms of searching. I’ve tried to move all of my genealogy notes into Evernote and that just didn’t feel right, either. Don’t get me wrong, I really like Evernote and use it on a daily basis for work. I take all of my work notes in it, as well as copious web clippings. I love that it syncs across all of my devices. But for genealogy notes I want something that feels more like a notebook crossed with scratch paper. As an avid Mac Power Users listener, I’m interested to see what David Sparks concludes in terms of using tags. I have a feeling that may be the direction I am heading in. Theoretically, then it won’t matter which file type I use—as long as I’m using the same tagging consistently—I should always be able to find what I need. Since I first tested my DNA using Ancestry.com, they’ve updated their data and I’ve had both of my parents tested at 23andme. Lastly, I’ve also had my mtDNA tested at FamilyTreeDNA so that I could join the Armenian DNA Project. Additionally, I’ve spent a ton of time at gedmatch.com and have asked Douglas McDonald, who performs BioGeographical Ancestry testing on raw data from 23andme, to look at the data for both of my parents. I hadn’t realized how much I’d done until I wrote it out all. It’s a lot and I still only understand small pieces of my results and how I may link with others. Ethnically, I think I know what’s up, but there are a few surprises. but with 0.3% African which is real, and other things seen on the chromosomes which are likely noise. 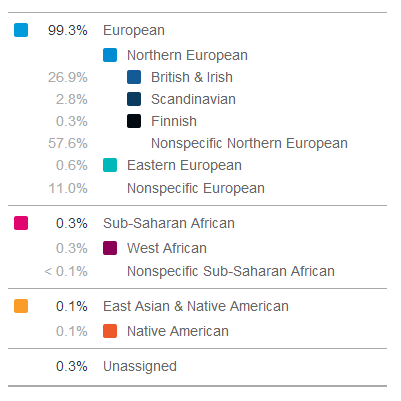 None of this was a surprise, actually, but it was interesting to see that the 0.3% African wasn’t noise as I thought it could be, along with the Native American. Based on where his family has been geographically in the US and how long they’ve been here, I had always assumed one or both would show up. Now how to find where or when that came into his DNA? That’s the hard part. So Doug is right-on with her being half-Armenian and half either German or English. 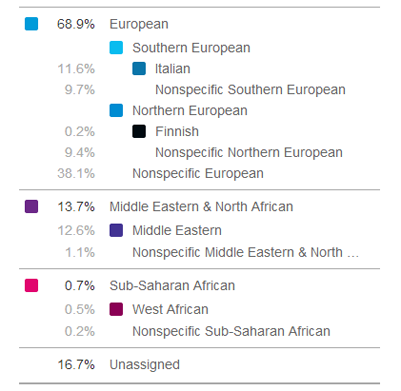 I believe that 23andMe is seeing some of her Armenian DNA as Italian for some reason. I’m really 99% certain that she does not have any Italian ancestors. On gedmatch, I’ve connected with a woman who shares a 5th great-grandfather with me. In 1808 Thomas Roberson married Rebecca Clackler in Putnam County, Georgia. Thomas was Scots-Irish originally from the Abbeville District in South Carolina and Rebecca descended from John Clackler, who came from Rotterdam in the Netherlands to Chevous Creek in Edgefield County, South Carolina. In Rotterdam he was called a “foreign Protestant”, so I’m not sure where he originally came from. My guess is England, Ireland or Scotland. At any rate, Thomas and Rebecca had 10 children. Their son Thomas Jefferson Roberson was my 4th great grandfather and another son, James Jackson Roberson was this woman’s 3rd great grandfather and… we swabbed our cheeks, had the data analyzed and met up on the internet because we had matching spots on our chromosomes. How totally weird. I’ve been interested in having my DNA tested for a while, but it’s been too expensive. Ancestry.com has launched a new DNA testing service and as a subscriber, I was given a special deal… so I took it. I received my results last night and at first I was surprised. I’ve read more into it and it started to make sense. 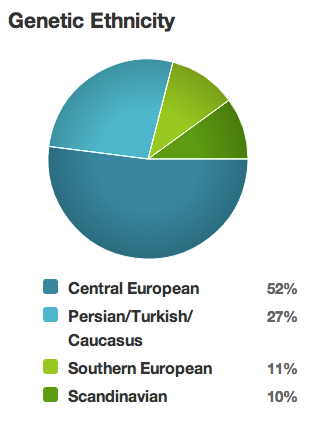 First, I have to say it’s pretty excellent to see the 27% Armenian blood. That can be detected from my saliva! It’s particularly amazing when you’re from a group of people who another group tried to wipe off the planet. 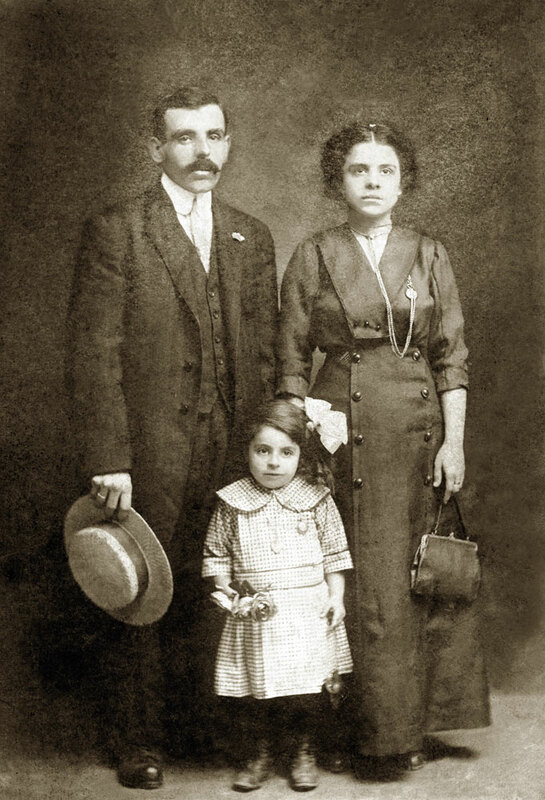 They forced my people out of their homeland, but nearly 100 years later, I’m carring their DNA inside me! Crazy. The large Central European percentage surprised me–I had imagined that I’d see more British Isles (rather than NONE). So Central Europe includes places I know my family comes from: Germany and Switzerland. Here’s the thing– this is also where the Celts originated. So I’m guessing a good amount of my percentage is Celtic and therefore British. 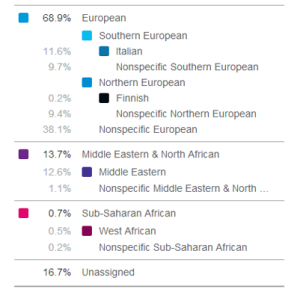 The 11% Southern European is a total surprise, but I do have people in my family I don’t know a lot about. It’ll be interesting to see how detailed that can get once Ancestry amasses more data. “Italy, Spain and Portugal” isn’t specific enough for me. Finally, the 10% Scandinavian felt surprising at first, as well. I haven’t found anyone from Denmark, Norway or Sweden in my ancestry. Reading deeper I see this is where the Vikings started out and some ended up in Northern England, Scotland and Ireland. This would make sense for the Scots-Irish and Northern British people in my family tree. Some people aren’t sure if they trust AncestryDNA, but my results seem like mostly they line up with my assumptions. The Genetic Genealogist has a great post addressing Ancestry’s Ethnic Prediction, which makes sense to me. I don’t think this is a perfect test and for me, it felt like a taste of DNA testing. I would like to test again, with another service, and be able to download the raw data of my results. If my British/Scottish ancestors are represented well in these results it does make me hope the results get more detailed. For instance, are my British ancestors oringinally Anglo Saxons–originating in Germany? Or Normans originating in France? Or were they Celts? “Central Europe” covers all of these, so sure, they’re in there, but where? None of this matters in a big way to me, except perhaps to pinpoint ancestors that I simply have not been able to uncover in other ways. It’s also just amazing to spit in a plastic tube, mail it away, have a lab analyze it and then tell you where your ancestors came from. Amazing and really weird. Couldn’t help, but name this post with words from a Damien Jurado song–I often think of it when I think of Ohio. In a previous post, I mentioned that a genealogy of my family was done in the fifties and sixties and added to the Library of Congress. From that genealogy, I learned a lot about the family migrating to Ohio between 1828 and 1830 after years in Virginia. One of my great-grandfathers, Jerome Drais, went to Fayette County, Ohio with his parents and married a girl from Ohio. Together they farmed in Washington Court House, Ohio where they lived in a log house until 1848 when a larger house was built. That larger house is where my 3rd great grandfather, the Civil War vet, was born. He and his 5 brothers left from this house to serve in the Union Army during the war. While my great grandfather ended up in Gettysburg, PA, much of the family stayed in Washington Court House. I learned from this genealogy that his sister stayed on the farm and raised her family there and when this genealogy was researched, her grandson was still on the farm. Since the farm stayed in the family from the 1830s until the 1960s, I wondered if perhaps it was still in the family. Thanks to the names from the genealogy and the Fayette County Assessor’s database, I’ve learned that the same grandson is living on the farm. Amazing.